IR’s inaugural IR Summer Volleyball Camp attendees gather for a photo during the camp on Thursday, June 21. It was a week filled with learning and fun with the game of volleyball for campers at the inaugural Indian River Summer Volleyball Camp, held at Selbyville Middle School. 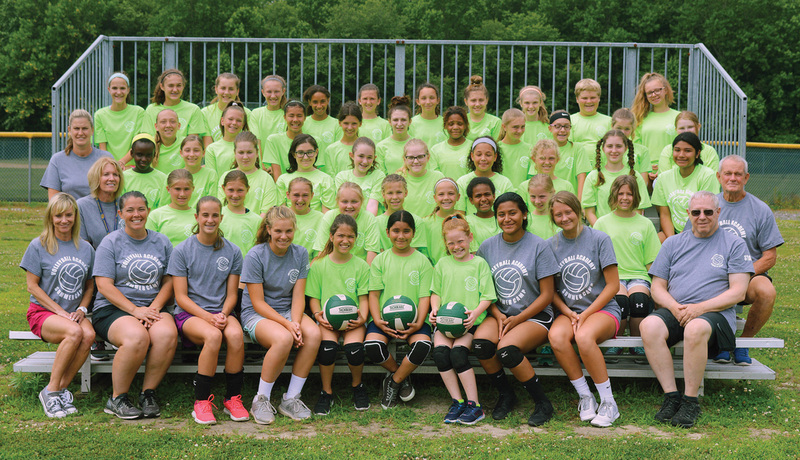 Coaches Bill Croal, Sally Craig, Ashley Revel and Lisa Stetler welcomed 45 youngsters for a week of indoor and outdoor activity, with drills and skills work, as well as some fun games — all centered around learning the game of volleyball. Campers were there from Monday to Thursday from 8 a.m. to noon. During that time, they worked on several different drills to hone their skills with serving, setting and blocking. There were also games and competitions to help develop those skills learned along the way. The campers each received a T-shirt for their participation and were treated to a pizza party at the conclusion of the week.